Below is an article sent to me by a dear friend. He knows me well in this area and lives through many of the battles of faith vs commonsense that I traverse regularly, in fact, more regularly these days. I make this point right at the beginning so as to avoid any sense of hypocrisy in the area of staying in South Africa. I have been very negative of late in this area of what has become commonsensical to me. I find it very difficult to avoid the evidence as it piles up in favour of those who “pack for Perth.” Tonight I have a friend coming back from overseas who has had more than a good look in the country where he can obtain an ancestral visa. A week ago I had lunch with another friend who spent 6 weeks in Thailand looking and seeing. Let’s not fool ourselves; it was a coloured ex-South African man who had emigrated and who was wounded in the Christchurch massacre. But one thing I am coming across in the current tragic polarisation that is taking place is broadly four kinds of people: One who goes because they just “can’t live here anymore”; One who stays here and broods because they “can’t go anywhere”; One who stays here and “doesn’t read those things” to remain level-headed; and One who stays and really “does something to help”, however small. I know there are many permutations of these South African views and I have come to see that the reasons we think the way we do are as personal as the circumstances in which we each find ourselves. To leave is a very personal decision, almost unique to the individual or family. I’ve learned to accept the decision whatever the reason. However, in copying the article below, an open letter from an incredible man, I trust I could just speak a small word to those of us who are negative and even afraid of the future. I can’t give assurances, but I know that if you fester inside your tortoise shell, you will become even more cynical, negative, bitter and useless than if you acknowledge your concerns, give them a name in your brain, and get on with something, just a little something, good. Again to the rescue, Nelson Mandela who had 27 years of reasons to hate within a self-constructed fortress of bitterness, but said: Resentment is like drinking poison and then hoping it will kill your enemies. Find that little something good to do in your daily life. We are not all OUTA CEO’s but we can all do something for someone or something. We have a lady in Hermanus who is a “swallow” from England. She noticed our cemetery was weed-ridden and poorly kept. She compared it to those she knows back home and wrote of her initiative in The Village News. With her own funds, she got a team together of workers and volunteers and cleaned up the cemetery. While the rest of use drove passed and complained about the municipality, she toiled. Eventually, they had cleaned the grounds and begun some very beautiful touches. Before I describe them, at this stage she opened up the opportunity for interested parties to pay a monthly donation of R250 maximum into a trust account for the work to proceed. Then, I think whether she got the donations or not, she put up little white painted crosses on the unmarked graves and began to get Calendulas from anywhere to plant in prepared gardens. For those who don’t know them, they’re waterwise and give a beautiful display of colourful, daisy-like flowers through Spring and Summer. Com’on you say, that’s extreme and she should have just enjoyed her summer holiday and gone back to admire her UK cemeteries. Well, that’s just the point – she decided to do something in one town in the whole of South Africa that everyone else thought was the responsibility of someone else, and for all we know, this may be the only recognition she’s had outside the town. What about Hermanus Siyakha [Meaning: Building Together] which, if it catches flame, could be applied in every town in South Africa? Interest free micro-loans to micro-businesses supported by mentors [twenty aged, highly competent Hermanus men and women who have a progenerative passion], and community-funded on the internet. Have a look on: www.hermanussiyakha.co.za. And what about the fact that the Hermanus Night Shelter, against multiple odds including “no money”, got its roof on last week. The project is passionately driven by a man in his mid-70’s. Flippen’ amazing, I can tell you! Point is, South Africa never allows you to sit on the fence unless you’re a die-hard. Opportunities abound and when you’ve done something there’s always a “stretch something” beyond it. I know it gets difficult to look at what’s going on and not be lost in the sea of it, but there is something You can do. Find it and do it. As per François Pienaar’s MAD [Make a Difference] organization, “be the change you want to see”. Hopefully, you’re challenged to read this article with a different, upward-looking perspective…. 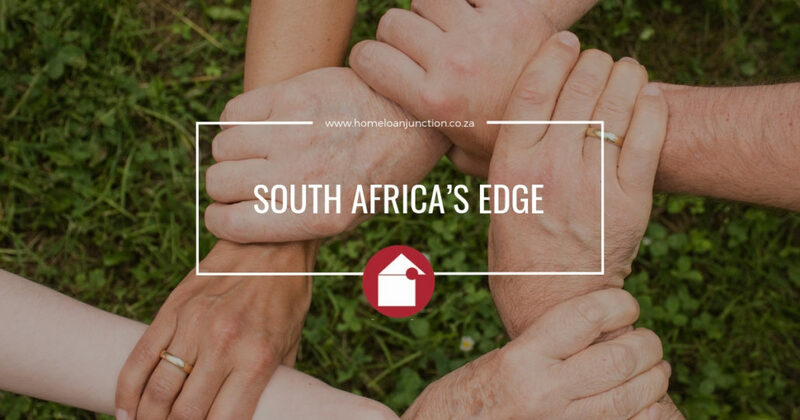 I called this blog, South Africa’s Edge. You may have thought I was thinking of the cliff we look into every day. It’s unassailably daunting whether you’re at the top or the bottom. But actually, I’m talking about you and me. You and I, the people of this beautiful, tortured country are the EDGE! Jack Welsh, the famous CEO of General Electric, defined people with EDGE as having: Enthusiasm; Differentiation; Guts and Energy [as adapted from his book, Control Your Destiny or someone else will]. Even if you’re one week from going, do something “vir oulaas” even if it’s putting R250 into the Hermanus Siyakha project – you have no idea if the next Business Woman of the Year is in that photograph.